Typical Leos are very helpful and generous to their friends, lovers, and family members, and also very protective. They won’t tolerate others badmouthing those they care about, and they’re willing to fight about it. Leos also have a tendency to be domineering due to a natural inclination for leadership. This can lead to friction if they date strong, independent-minded individuals, though these are exactly the sort of people that Leos are drawn to. On the positive side, the need to lead can also manifest in supportive, nurturing behavior. Typical Leos are loyal and romantic. When they fall in love, they fall heavily. They have very idealistic, traditional notions about friendship and love, tending to put people on pedestals from which they inevitably fall, leaving the Leo disappointed and heartbroken. A betrayed Leo will not easily get over the hurt. The wounds run deep. However, loving gestures have an equally profound effect. A thoughtful gift, a home-cooked meal, or any other tangible expression of appreciation can do wonders for a Leo’s mood. In a romantic relationship, Leos are passionate and extravagant. They like to make big splashy gestures and money can go fast, but it will be spent on fun activities, good food, and presents. Leos are equally generous with their friends, paying for or cooking lavish dinners or buying rounds of drinks. They are also quick to offer assistance to those in need (with this tendency to burn through money, Leos can develop serious financial problems). Leos need a lot of attention, perhaps even admiration, but they are willing to give the same to their partners and friends. They are very physically affectionate, and do best with friends and lovers who are also physically demonstrative. While they prefer to be the center of attention, Leos are as generous with affectionate gestures as they are with money and time. The typical Leo is selfish only in the emotional realm. When Leos have unmet emotional needs, they are not sensitive to the emotional needs of others until their own requirements have been fulfilled. Leos are quite sensitive and moody, and this tendency, combined with their need to be admired, means that they don’t take criticism from partners or friends very well. 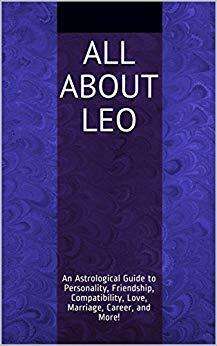 Typical Leos are affectionate and loving toward their mates, except when they feel they have been slighted, at which point they can cool significantly for a while. On the positive side, when Leos do forgive, they usually forgive completely. Like all the fire signs, they are swift to anger but get over things quickly as well. The typical Leo is physically active and extroverted, and enjoys a bit of risk-taking. Most Leos prefer to get out, do things, and meet people rather than sitting around the house. Leos tend to be cheerful, good-natured, confident, and optimistic, which can be uplifting for those around them. They do best with energetic, playful companions who provide the attention they need and don’t take advantage of their generous, trusting natures. The sun sign isn’t the only element that influences personality. Aspects and planetary placements, particularly the moon sign and rising sign (ascendant), are also important. For example, a Leo with Aquarius rising will be less traditional, sensitive, and protective and more open-minded. A Virgo ascendant can also have a dramatic effect on the Leo personality, making a Leo less physically demonstrative and prone to risk taking and more humble, practical, and sensible with money. There are many websites that offer free chart calculation to determine other planetary placements and aspects. Learning these other planetary placements is recommended, as it provides a more comprehensive personality profile. For more on Leo, see the Leo Personality Profile. To see personality and compatibility profiles for all the sun signs, visit the main Astrology page. Bugler, Ashford, Chubb, & Zapp. (1992). The Complete Handbook of Astrology. Fenton, S. (1989). Rising Signs. Woolfolk, J.M. (1992). The Only Astrology Book You’ll Ever Need.